A slow start. A first, healthy breakfast of eggs, mushrooms, spinach and coconut oil. A second, unhealthy breakfast of bacon, beans, fried mushrooms, sausage, and toast. There was no hurry with the rain, weather that matched the hungover mood. 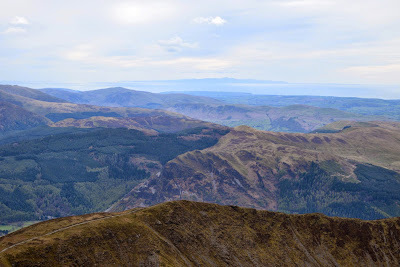 I had climbed Helvellyn plus three other hills the day before, and met old friends in Keswick on Friday night. We had drunk far more than was sensible for middle aged guys with mortgages and families. In our delicate state we were going to drive nowhere. 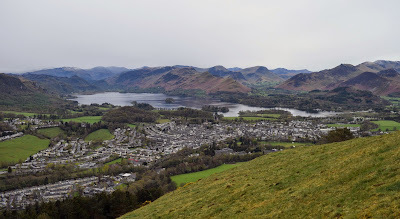 Skiddaw might be bland and boring to walk on, but it rises directly behind Keswick in a majestic sweep and so we tenderly set off in the rain for what we expected, if we are honest, to be a slog. 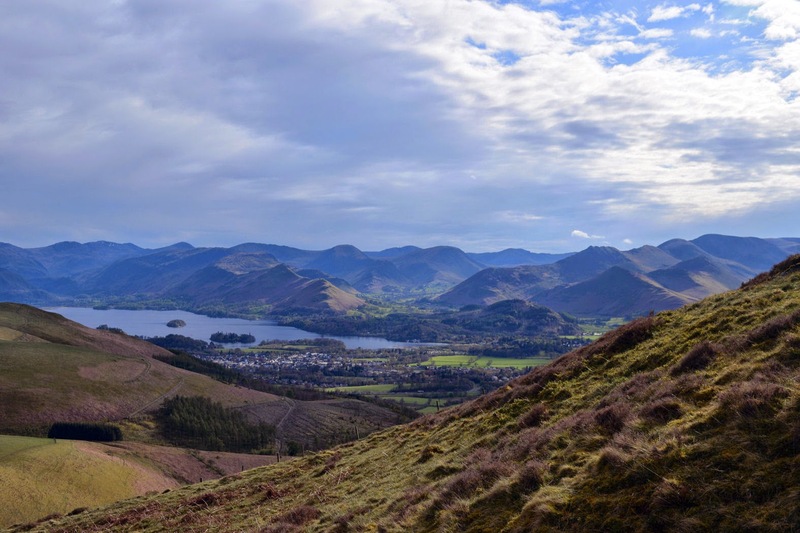 The first of the day's objectives was Latrigg. 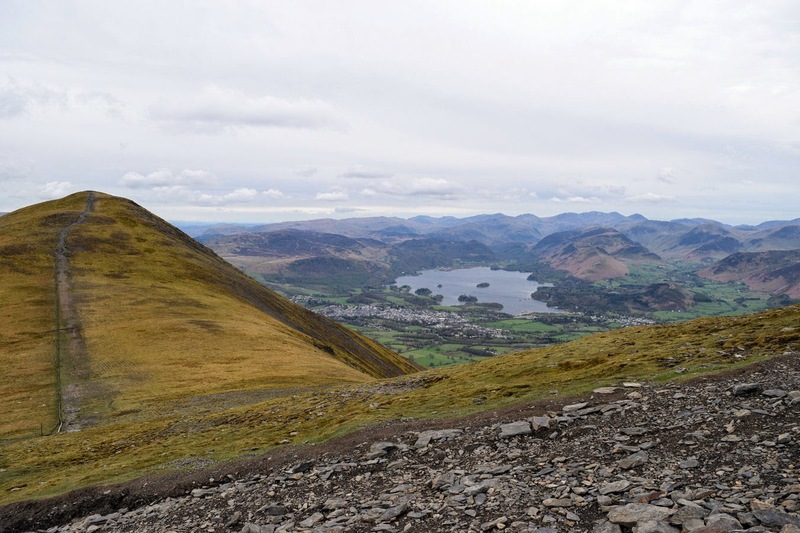 Reaching this took us two hours, having got lost in Keswick first, then bimbling amiably up its steep flanks. 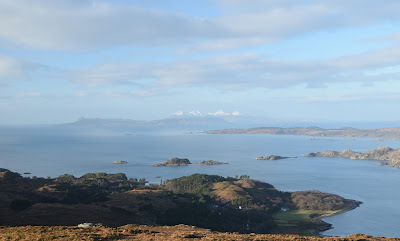 But by the top, the rain had stopped and the cloud lifted. It was going to be a no bad day. 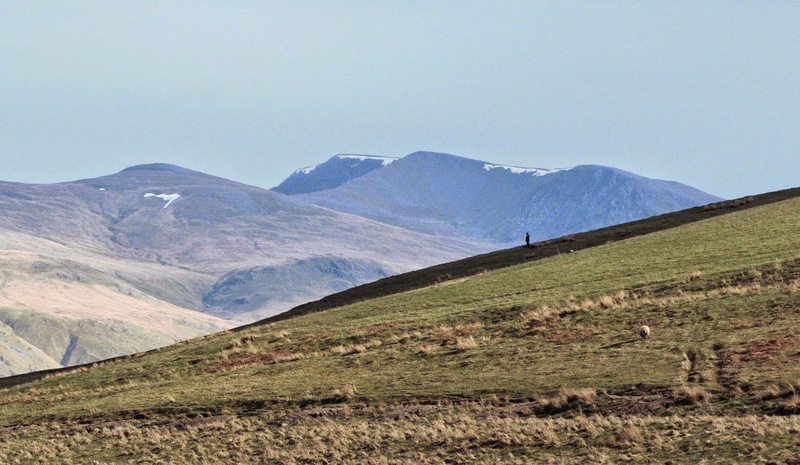 Skiddaw contains a Dodd, of which there are many in this area. "Graphite," said Cammy, dod being the local word to denote hills containing this pencil-making material. (Keswick did used to have a pencil factory, after all.) This also makes for rounded outlines. Skiddaw and the northern hills of Blencathra and Knott are quite different to the rest of the Lake District, more Scottish in character, the glen between the three hills unrelieved by quaintness. 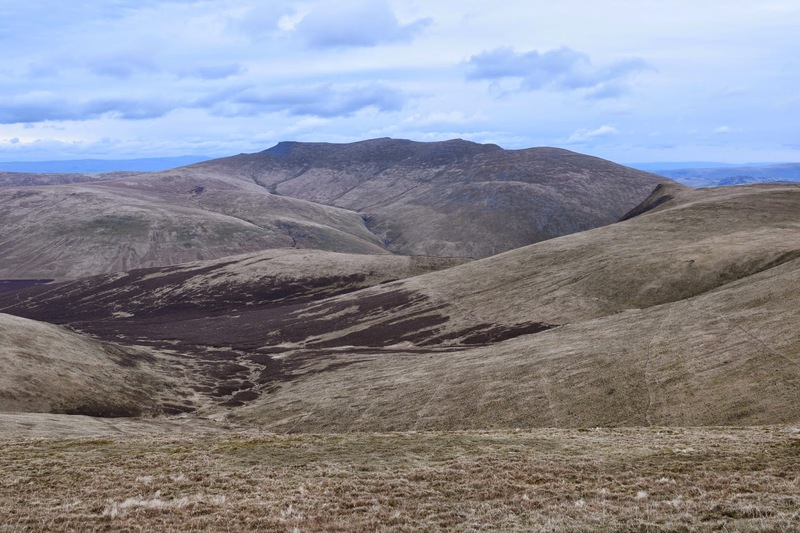 It was freezing cold on top, the winter weather resolutely determined to stay despite spring's lengthening days. I was happy though. 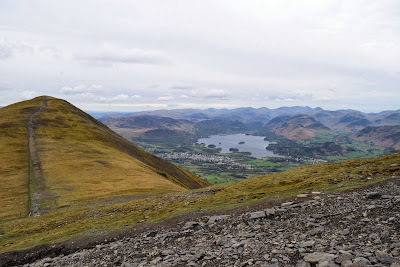 This was my last English 3,000ft hill - The Scafells, Helvellyn, and now Skiddaw. Twenty years separated the first and the last. Now for the Welsh 3000ers. 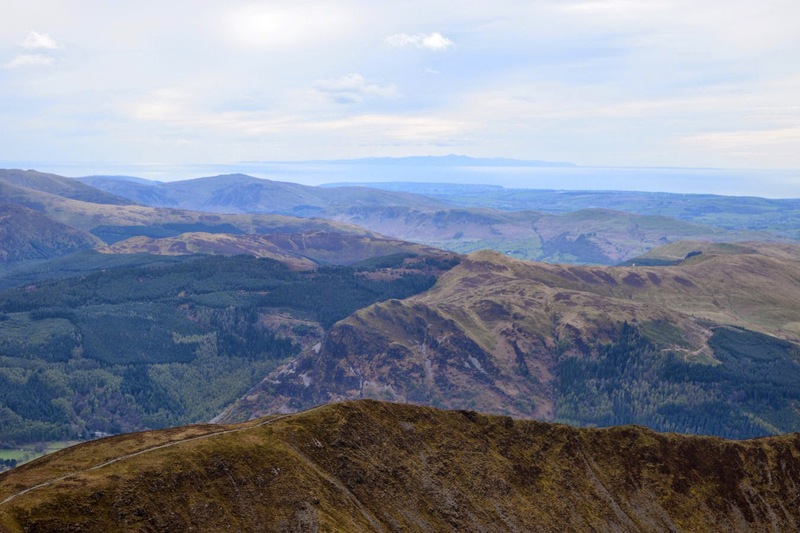 Another place I'd like to go is the Isle of Man - visible from the top of Skiddaw. I've been to Snaefellsnes in Iceland. It would be nice to climb its British namesake. 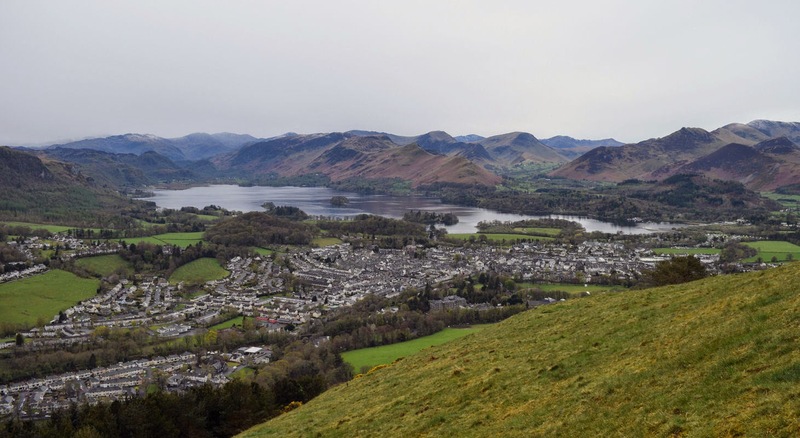 The views down to Derwentwater are good. 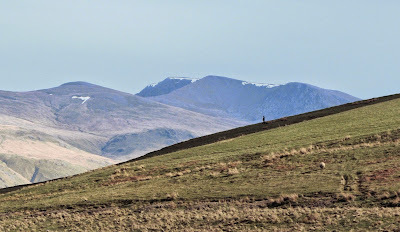 Did we really have to walk all that way back to Keswick? As we descended, the sun came out. Something we'd not have expected when we set off. Had we been sensible the night before and had an early start, we would have missed this! It was a glorious walk back down. We headed into Keswick basking in sunshine, and while the others planned dinner, I headed back up the road towards Edinburgh, taking the A7 to re-familiarise myself with more Borders countryside and towns. A good trip to the Lake District.